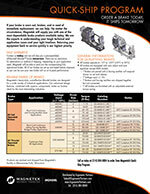 We are a master distributor for Mondel. 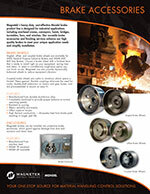 Magnetek can furnish standard and custom engineered Mondel Brakes to meet the requirements of your application. 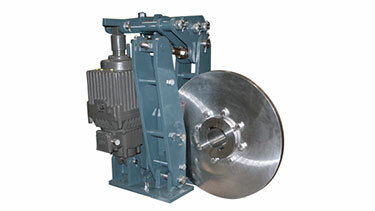 Our engineers design Magnetek brakes with simple brake release designs, unique torque or dimensional requirements, and brakes that meet specific environmental considerations. Let one of Ergonomic Partners crane engineers help size the Mondel Brake that will help improve your cranes performance. This video features the install of a brake on a large overhead crane electric motor. These brakes are named "mill duty". Which refers to the type of use such as in a mill or a modern iron and steel processing facility. Mondel 200S range of industrial shoe brakes are suitable for applications on rotating loads requiring braking and holding torque. 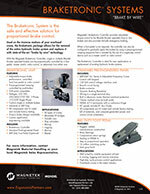 Ideal for machinery which require reliable stopping and holding. 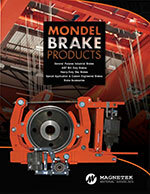 Mondel Disc Brakes can be customized to meet your specific needs. The 400D is ideal as a drop-in replacement for your high duty cycle, high speed or high torque stopping applications using existing disc brakes. Fast Response – standard units 2,000 cycles per hour, Spring Applied and Electronic Release, Class F Insulation. Optional Automatic Adjustment (AA) - automatically compensates for lining wear; eliminates time required to manually adjust linkages for brake shoe lining wear. Optional Automatic Equalization (AE) – automatically equalizes and maintains running shoe clearance which provides balanced braking and equal brake pad wear. Optional external torque spring for bridge and trolley motion. Braketronic Control Capable. Fast Response – standard units 2,000 cycles per hour. Spring Applied and Electronic Release. Class F Insulation. Optional external torque spring for bridge and trolley motion. Spring applied – electrically released. Sintered metal friction pads on quick replacement liners. Stainless steel pivot pins running in self-lubricating bushings. Optional external torque spring with calibrated indicator. Externally adjustable stepless time delays in both directions. Braketronic Systems – "Brake by Wire"
Magneteks Braketronic Controller provides variable torque control to a Mondel Thruster Shoe or Disc Brake. By utilizing a Braketronic unit, single or multiple crane brakes can be proportionally controlled by a foot pedal, master switch, or radio control. The controller can also be configured to apply the crane brakes by pre-programmed ramping initiated by the use of a single-step control device. The Braketronic is ideal for replacing existing hydraulic systems and provides a fail-safe emergency braking for overhead crane applications. 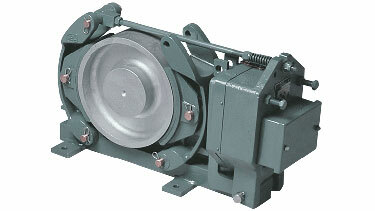 The Braketronic System has several features and options: Variable torque brake performance controlled by foot pedal or radio, Pre-programmed ramping controlled by push-buttons, Control single or multiple brakes, Suitable for industrial or mill duty applications, Optional enclosure heaters for low ambient temperatures. Ergonomic Partners services and is a distributor for Mondel Brakes; serving clients from coast to coast, Canada, Mexico and especially focused in the states of Missouri, Illinois, Indiana, Kansas, Arkansas, Mississippi, Nebraska, Tennessee, Kentucky, Iowa, and Oklahoma.